Aged in barrels with premium California olives, this triple filtered brine measures up to the finest spirits. Empty olive jars in the fridge are an occupational hazard for fans of the dirty martini—the salty, savory cocktail that calls for olive juice to be added to the classic gin and vermouth recipe. Now you can give those jars a gold watch for dedication and retire them. 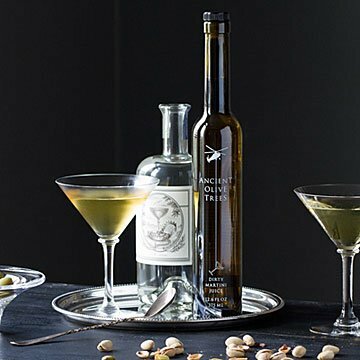 Made from brine aged in barrels with premium California olives, then triple filtered, our Barrel Aged Dirty Martini Elixir is a far worthier partner for your favorite gin or vodka. (Dirty Mezcal martinis exist too, fyi.) Having a bottle of this beautiful juice up your sleeve is almost an unfair advantage in the cocktail game. Made in California. Add 1/4 oz dirty martini juice to 2 oz of vodka or gin for the perfect dirty martini. I have already bought this product for a gift for someone's. I use it for dirty martini. Also recipe is on the bottle. Add to shaker with vodka and ice and hint of dry vermouth....PERFECT martini! One of the best gifts ever. My husband says ' I would give it a 10'! This was an excellent addition to the dirty martini! The taste and presentation of this bottle was spot on. Love this unique product. Never run out of olive juice again when fixing a dirty martini. Birthday gift for a very close friend. Quite a good impression, and a different than "typical" gift so was appreciated. Easy to shop with this site too. Great for a Dirty Martini! I bought this for my Father-in-Law who was always complaining about draining the juice out of his olives. He loves dirty martinis and he loves this olive juice! I always run out of olive juice before i run out of olives. This is the perfect solution. Delicious!